How do I eat E3Live? Some folks love E3Live's natural taste and drink it undiluted. Others prefer to mix E3Live with their favorite juice or pure water. 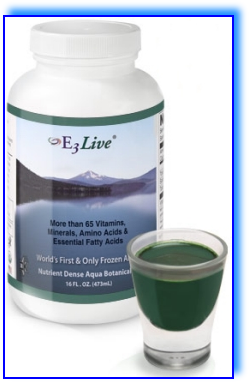 E3Live should always be kept cold to maintain its freshness, vitality and nutritional value. Some people travel with frozen bottles of E3Live, and find refrigeration as soon as possible when they arrive at their destination. Sometimes, however, refrigeration is not available. For this reason, Vision Inc. produces a superior grade of powdered or encapsulated freeze-dried AFA algae that does not need refrigeration. Whatever form of AFA algae meets your needs, you may be assured that you have in your possession only the highest quality, purest AFA algae on the planet. There's only one ingredient in E3Live, and that's 100% Aphanizomenon flos-aquae, a fresh water, edible species of blue-green algae. It's called "AFA Algae" for short, and it's at the very foundation of the entire food chain. For the first time in history, AFA algae, nature's most basic food, is available in its more vitally alive, LIQUID form. The AFA algae harvested for E3Live grows in a very special place, Upper Klamath Lake, Oregon. In fact, it's the only place in the world this species of algae is harvested. Perhaps it's the volcanic springs and the mineral-rich water, situated at 4200 feet elevation, which is fed by the surrounding Cascade Mountains. Or maybe it's the fresh air and life-giving sunlight, which is present over 300 days of the year. Most probably ALL of these factors contribute to the ideal growing conditions necessary for this organic, high life-force wild food to thrive. The numerous reported benefits of E3Live are based on scientific research, the clinical results of health care practitioners, and the testimonials of real people. Because AFA algae helps such a wide range of physical and mental symptoms, it's easy to fall into a "magic bullet" mentality associated with how drugs work in the body. AFA doesn't work that way. Aphanizomenon flos-aquae (AFA) algae is truly a superfood, not a drug. Artificial drugs are synthesized in the laboratory to produce specific effects on targeted cells, organs, body functions. Though some drugs save lives, unfortunately, most drugs also create unwanted side-effects and toxicity. In contrast, Nature's innate wisdom works through AFA algae's full spectrum of perfectly balanced, naturally occurring nutrients. AFA algae helps restore overall biological balance by "nourishing away" hidden nutritional deficiencies which are at the root of many diseases. Without any toxicity or harmful side-effects, this is how AFA algae can have so many beneficial nutritional and energetic effects throughout the body. 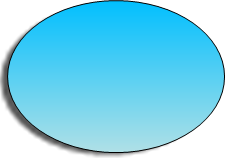 How much E3Live should a person eat per day? No two bodies are alike. For most people on a "not so great diet," it is recommended to start with a small amount, say, 1/2 to 1 teaspoon per day. Beginning with small quantities minimizes any possible temporary symptoms associated with your body's "housecleaning" of stored toxins. On the other hand, some people may need to eat E3Live in more liberal quantities to really "Feel the Difference" and drink several ounces a day whenever they need a boost. Work your way up at your own pace. How do I keep E3Live fresh? When defrosted and kept in a refrigerator, E3Live's shelf-life is approximately 10 days. In your freezer, it will last a full two years or longer. When you are ready to defrost a bottle of E3Live, first let it thaw out in your refrigerator. Then pour off what you think you'll use for a week or so, and re-freeze the rest until you need more. E3Live can be thawed and re-frozen several times as long as it always remains sufficiently cold. Every athlete wants to be "at the top of their game" for as long as possible. But it's not just about winning, it's the joy of physical activity itself. If you already excel in your chosen sport you can always improve your present training program and reach even greater heights. Difference" with AFA E3Live algae! In one study, two hours after eating 1.5 grams of AFA algae, an average of 40% (1 billion) of the immune system's natural killer cells migrated from the bloodstream into the tissues to do their work of seeking out and destroying cancerous and virally infected cells. No other food, drug, or substance is known to produce such dramatically positive effects on natural killer cell activity as AFA algae.